The best way to get to know a city is to get in touch with its daily life, walk its streets and observe its people. This tour offers a chance to become a “Santiaguino” for six hours and enjoy getting to the very core of Chile’s capital. Begin with a subway ride on the Metro – notable for its cleanliness and very good condition. The first stop is “Universidad de Chile” where visitors surface at Santiago’s splendid main avenue (Av. Libertador Bernardo O’Higgins, also known as Alameda). On the left you’ll see the main campus and looking north is “Paseo Ahumada”, the city’s main shopping and commercial centre. From here, several representative buildings are visited, such as “La Moneda” government palace and the Stock Exchange. 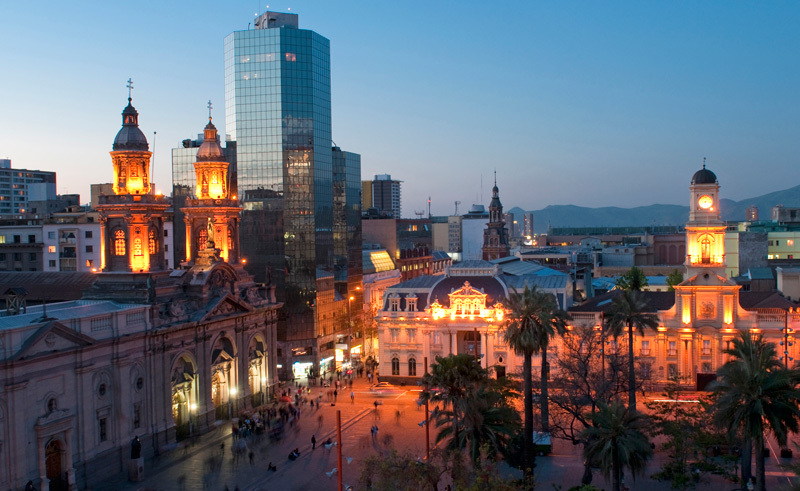 Later head to traditional Plaza de Armas square with Santiago’s grand Cathedral. Lunch will be enjoyed at El Galeon restaurant in the Central Market. It offers a host of seafood options. Next follows an introduction to bohemian Santiago with a visit to Barrio Bellavista, with its pubs and restaurants, where some of Chile’s typical drinks can be tasted – among them its world class wines. The tour concludes with a climb to San Cristobal hill – crowned by the radiant statue of the Virgin Mary – to revel in a spectacular view of the city, thus ending the day with a flourish.